Meet us at the St. Francis, and bring your own damn water! Happy Morgan's Eve, everyone. If you’re like FOTF, you’ve been preparing for the week ahead by breaking your day into 25-minute conversations. If our kids need to talk to us, we tell them to take the stairs to the tenth floor, run down the hall, squeeze past 120 people coming out of the bathroom, steal some bottled water left outside a partnering suite, and find Room 1450. Come in, sit down, just wait while we finish a few emails on our phones. Yes? You can’t sleep? Not exactly an unmet medical need. We’ve also wondered a few times if a toddler’s point blank sneeze into one’s mouth counts as a new form of immunotherapy. For those of you with older children, you might be practicing for JPMorgan this week when the conversation inevitably turns to financing. Hit your yard-work milestones to trigger the next allowance tranche. That’s the way it is as long as you live under my term sheet, er, roof. Whatever the year, there’s always a sensation of falling out of a holiday tree, or warm cozy bed, directly into the boiling JPMorgan cauldron. This year, organizers gave us a bit of a break, pushing the conference back one week, but the slight lag was immediately filled up by a breakneck filing of IPO documents: Six so far in the new year alone, adding to several that squeezed their paperwork through before the ball dropped on New Year’s Eve. (We have details on one of those filers, Flexion Therapeutics, in our roundup below.) A few of those, plus others still in the IPO queue after filing in the back half of 2013, have significant Phase II or Phase III clinical milestones. Yet others that haven’t declared publicly their IPO intentions also have big milestones upcoming, and we can’t help but think their S-1’s won’t be too far behind if a few companies currently in the queue make their debuts soon. In the next Start-Up, our colleague Stacy Lawrence previews several private companies with upcoming late-stage clinical data, and one thing’s clear: There’s not a lot of 100% novel technology working up the pipeline. That’s not to say the companies in question aren’t doing important or technically difficult work. But many of the products due for data have an element of de-risking that made for faster development and a more reasonable investment thesis, especially worth noting when the company is making a push in an indication where approval has been an elusive target. For example, Intarcia Therapeutics is delivering an off-patent diabetes drug, exenatide, via a subcutaneous pump that carries a year’s worth of treatment. Intarcia hasn’t filed an S-1 yet, not publicly anyway, but its deep roster of crossover investors makes one hear a ticking clock -- or is that the beat of the subcutaneous pump? We can’t help but pump Start-Up's upcoming A-List, the annual roundup of the year’s top Series A financings. The 2013 winners include entrants from the fields of gene therapy, immunotherapy, epigenetics and food allergies, and a few have had very unusual financial backers. Learning who's who will be your reward for surviving next week. Blueprint Medicines: The Cambridge, Mass. biotech said January 7 it had secured a $25 million Series B round as it pushes its selective kinase inhibitors, aimed at specific mutations mapped through its platform, toward the clinic. It says its lead compounds should enter the clinic in 2015. They are an inhibitor of the mutation that drives both systemic mastocystosis, an overproduction of mast cells in various organs and tissues, and a subset of gastrointestinal stromal tumors; and an inhibitor of a mutation that leads to a specific type of hepatocellular carcinoma. The firm was initially funded by Third Rock Ventures and Fidelity Biosciences, but neither of those deep-pocketed groups has taken the lead for the B round. Instead, Swiss oncology investment specialists Nextech Invest led the round, with crossover investors Biotech Value Fund and Casdin Capital, Third Rock, and Fidelity, and other undisclosed investors joining in. The crossovers could be a sign that Blueprint is gathering itself for a run at the public markets this year. The firm has been led since last spring by an interim CEO, Third Rock partner Alexis Borisy, who took over for co-founder Chris Varma without an announcement. – A.L. 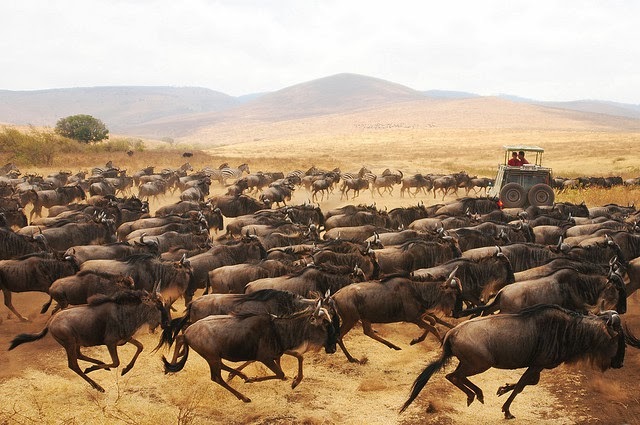 Stampeding wildebeests (heading to the Celgene presentation?) courtesy of t3rmin4t0r under Creative Commons license. Labels: Alzheimer's disease, angels, clinical development, crowdfunding, financings of the fortnight, FOTF, IPO, JP Morgan, oncology, Third Rock Ventures, venture capital, wildebeests!